I have tried the detailed schedules without success. Sadly, winging it also doesn’t work. The best thing I’ve found is a flexible weekly rhythm for all aspects of my life, accompanied by some set-in-stone routines that preserve the sanity. NOTE: I have expanded this printable into a FULL, fillable, homemaking planner with a corresponding ecourse to help you get it all set up! 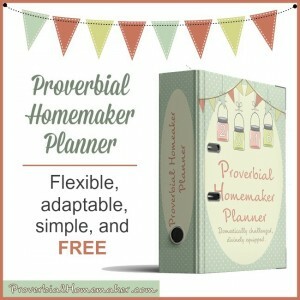 Check out the Proverbial Homemaker Planner & eCourse! I have included pictures to show you how I filled out our planning pages. Please use them for inspiration but make them your own! What is important to me may not be important to you and our family cultures are likely different, not to mention our Sun/Mon weekend schedule. Taking Stock: Brain dump all the things you want to get done in a week. Whittle it down to the most important things. This is a working document, so use pencil! Weekly Rhythm: Organized by day and time block (no specific times). Plug in the regular activities you already do and then assign one main task to the rest of the time blocks using your Taking Stock sheet. One “must-do” item per block. You can add asterisk items that are details or secondary tasks, but they can be moved around or chucked when life gets busy. Sealed Routines: A cheat sheet for basic routines you want to practice until they’re sealed in. Cultivate and Preserve: This is new for me and will be laminated or printed each month and filled out with new information. It’s a page you can look at every morning as you prepare for the day. It will help you keep your most important goals and routines foremost in your mind. *Note: Since taking these images, I have changed “homeschooling” in the printables below to “learning” so they are usable by everyone. Your Cultivate and Preserve page should be read through every morning. Put it somewhere that forces you to look at it: bathroom mirror, with your Bible, on your coffee pot or cup, etc. Don’t be perfect. Get something workable on paper and then start working it! You can change it over time as you figure out what works! Be flexible. There will be overlap and things will move around. You won’t get everything done every day. It’s ok! It’s just a tool, so make it work for you. Identify the optional. I like to put only one “must-do” task in each of the Rhythm time slots and then add asterisk items if they are a detail or add-on task. I want to do the asterisk items, but being flexible means being ok with the days when they don’t happen. Don’t do it all. Not everything in your Taking Stock sheet needs to be on your Weekly Rhythm. Sometimes it will show up in a routine or in a focus point on your Cultivate and Preserve sheet. It may also be something you’re not ready to do right now and that’s ok! One thing at a time. Pick only one or two good habits to work on every month (on the Cultivate and Preserve sheet). Pick one routine to nail down. Trying to do too many new things at once is the BIGGEST reason why I fail at these efforts. I love this! Sharing on my page! I love this! Sharing it on my page! Love these…. and I have looked at sooooo many routine/planning ideas/printables. These really resonate with me. Thank you so much for sharing, Tauna! I love these! But… We don’t homeschool. Is there a way I can get blank ones? Or something like homework instead of homeschool? Hi hovist1tl! That’s a great idea. I just uploaded an additional version of the Cultivate and Preserve doc to say “learning” instead of “homeschool.” That way it could be about what your kids are learning or what you are learning. I believe that’s the only place I mention homeschooling, but let me know if I’m wrong. Sorry I didn’t think about that before! Thanks for the suggestion. Thank you! That’s amazing you got that done so fast! Homeschooling is also on the taking stock page. I love the choice “Learning”. That fits our family well! My girls are in preschool and every month we get a list of what they are working on- this will be a great place to summarize that! You are truly amazing! Thank you! I use the taking stock document often and I’m trilled to pieces to have one even more tailored to my family! I can’t thank you enough! This is pure genius! I’ve home schooled before but my last child is a lot different than the others. He has issues (like SPD and GAD for starters) that don’t do well with a strict schedule, yet winging it was a mess! Public school was a nightmare. I have been feeling so guilty & overwhelmed, worrying if I’m doing right by my son. It’s been so stressful, not like with my other children. I think this will give us the best of both worlds & put joy back into our home schooling. Thank you so much! God bless! I just found your planning sheets. This looks perfect for me. Thanks! I have a few questions about your filled in sheets. What does your ‘meal ministry’ entail? What is blanket time/QT? No problem! Meal ministry for me is simply finding people in our neighborhood or church who might need a meal (or wouldn’t object too hard if I brought one) and making it for them. It’s strange to me how weak meals ministries can be in churches, and it’s also something that can really build a major bond with your neighbors. People like food! Especially if we can find out what they like. It speaks volumes. Blanket time is awesome. I really need to write a post on it (will put it on my calendar) because I am asked about it a lot. Basically, you start teaching kids ages 1 and up to stay on a special blanket with special toys for up to a half hour. Start with 5 minutes and just keep putting them back on the blanket. Older kids get disciplined if it’s a disobedience issue, but most of the training is teaching the rules and boundaries. Eventually they look forward to it. It’s great for quiet time or when you are cooking or at the doctor’s. QT is just quiet time. The older kids can play in their rooms quietly, sit on the couch and read, or listen to an audiobook. Hi! Love your site. 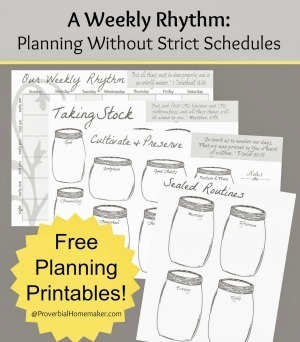 I have been subscribed now but I still can’t figure out how to get this weekly rhythms printable. Is there a link for it somewhere? I’ve printed and started filling in the forms. LOVE them!! Thanks so much! When I click in my email, I’m getting a message which reads unable to download in safari. Admittedly a bit web challenged but fairly able to navigate, is there something else I need to do? Hi Amy! I’m not sure. All I use is Safari and it works for me! Perhaps try Firefox or Chrome? Just today, I was thinking, “I wish that I could find something for a daily schedule, that’s not a schedule, but isn’t just stand-up improv (read: nothing of any worth accomplished) all week long.” !!! THEN HERE IT IS! Looks like I will be able to add it to my Proverbial Homemaker Planner and it will work great!! Pardon the gratuitous use of exclamation points. 😀 I’m so glad you found it helpful Sarah! !